Many food bloggers (and other fans of food) dream about becoming a cookbook author someday. They flip through cookbooks in the bookstore and fantasize about what it would be like to see their name on the cover and see their food photography on those glossy pages. But, many of them wait around for a publisher to come calling. They either wind up waiting many years for their dream to come true, or they never realize that dream at all. 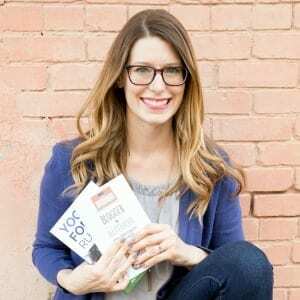 I’m excited to feature an interview with registered dietitian and author Maggie Michalczyk in this episode. Maggie decided that she wanted to publish a cookbook, but that she didn’t want to wait around to get a deal with a traditional publisher. Instead, Maggie decided to take her cookbook’s fate into her own hands and self-publish. Best of all, she leveraged her relationships with brands to get them to sponsor recipes in the cookbook, giving her money to fuel the production of the book. If you dream about publishing a cookbook someday, I think you’ll find this interview with Maggie very inspiring. Maggie will show you that you don’t have to wait for a deal with a publisher to create your cookbook. And, you’ll also hear some great tips for working with brand sponsors to help you offset the cost of the production of your cookbook. GET YOUR FREE GUIDE! Download your FREE Cookbook Planning Guide to fast track your path to publishing your cookbook. Maggie is a Chicago-based registered dietitian who specializes in recipe development and focuses on seasonal foods, especially all things pumpkin during the fall! One year ago Maggie left her corporate job to expand her blog Once Upon a Pumpkin, and gain more experience with individual nutrition counseling. Fun fact is that her dog’s name is also Pumpkin! Click here to get your copy of Maggie’s cookbook, Once Upon a Pumpkin: 50 Creative Pumpkin Seasoned, Flavored, Shaped & Spiced Recipes. Curious about what it takes to self-publish a cookbook? Check out this interview with @ThePumpkinRDN! Beth: Thank you very much for coming on the podcast. Maggie, I’m really excited to talk to you today. Maggie: Thanks for having me. I’m so excited to talk, too. Beth: Absolutely, absolutely. See, could you start out by just telling us a little bit about yourself and your blog and your cookbook to. Maggie: Yeah, so I’m Maggie Michalczyk. I’m a registered dietitian based in Chicago. I have a little bit of a communications background when it comes to nutrition. That’s how I started my rd career and then I’m really in the last couple of years have focused on growing my blog, which is called the once upon a pumpkin and I think it’s safe to say it focuses on, um, all types of seasonal things throughout the season, but especially all things pumpkin and fall themed in the fall. So I’m in. I’m definitely what’s my favorite season right now. Maggie: I just, with your help, launched my first cookbook called Once Upon a Pumpkin, where I share 50 pumpkin spiced and seasoned recipes. Beth: Yes. And I want to point out to everybody listening that your book actually made it to bestseller in print, which is much more difficult to do than with a Kindle book, And right now is the time we’re recording this, it’s got that nice little, a number one new release flag next to it. So that’s pretty cool. Congratulations. Maggie: Thank you. It was really exciting to see. Beth: Yeah, absolutely. So Maggie, can you tell us more about why you decided to write a cookbook and sort of your inspiration behind it? Maggie: Yeah. So as I got to thinking, as you know, the summer was kind of going on. I kind of started thinking, you know, what, what else can I do this fall to set myself apart to really put something out there that’s 100 percent me and have that body of work. Maggie: And while I do like blogging and putting up recipes on my blog and exploring different topics on there, I just thought, you know, how else can I go beyond that with some of the brands that I’m working with are just really share all of my ideas in one place. And so then I got to thinking, okay, you know, maybe I can put something together that uses, you know, all of this content that I had, but I wasn’t necessarily living anywhere so it wasn’t on my blog, but half the pictures were on my phone type thing. And so yeah, that’s what really inspired me to see if I could put together a book. Beth: Yeah. And that’s, I think a great lesson to those of you who are listening that if you have a lot of content that’s living somewhere, whether it is your blog or your phone or whatever it is, it’s a great i dea to figure out a way to repurpose it and make it work for you and literally pay for. Maggie: Yeah, for sure. I mean, and I was getting to a point where like there’s just not enough storage space on my phone too. I was like, okay, I’m taking all these pictures. Sometimes I blog about them, sometimes I don’t, I like this recipe but I still need to tweak it. And so I was like, okay, if I can get all that stuff together, then I kind of already have some stuff to work with. Beth: Yeah, absolutely. And so what made you decide to self publish your book? Maggie: So I think it was kind of the whole idea of like I didn’t want to have to wait for anything and I wanted to do it for myself to have ready by this fall. So in hindsight, I think I could have started thinking about this earlier into the year, but you know, how those things kind of go, you’re just like get the idea and you kind of want it done sooner than later. Maggie: And so yeah, this fall time was coming up and so I thought, you know, let me see if there is a way to do this and you know, how long would that take? Do I have a, the time to do it? Like do I have the ideas and the content like halfway done or are sort of there that I can work off of. And um, I think mainly it was the timing and learning from you that this could be done in just a few short months or you know, here and there that it would, it could get up on Amazon faster than I thought. So I thought, you know, that is something I’d want to have ready for this fall. Beth: Yeah, absolutely. And I’ll just fill in the listeners on the fact that like, so obviously your book is fall themed and so I think that you timed it perfectly. So you launched, I believe, the day after Labor Day, correct? Beth: And so if you have a book that seasonal or you’re thinking about doing a book that seasonal, definitely make sure that your timing it properly. So Maggie, you decided to launch it (which I think was incredibly smart) right after Labor Day, which is the unofficial end of summer and beginning of fall. Right? So that’s when people are really thinking about fall and pumpkin everything and getting excited about the return of the Pumpkin Spice Latte and pumpkin foods and everything. And so I think it was incredibly, incredibly smart that you monopolized on the timing there to really give your book a big boost. Maggie: Yeah, no, and, and that was something that I kind of saw, um, in years prior to when I would start going fully all things pumpkin and seasonal and I’d start talking about them or just even noticing stuff in the store. Maggie: I started noticing, well some of it comes out before that Labor Day weekend and people get really excited but they’re not sure if they want to say it yet because they still want to hang on to summer. And so I knew that that timeframe was like, people are starting to get really excited and then those people who were like, no, I’m definitely waiting until after Labor Day could then jump on board to the day right after because they want to be. I’m excited about fall and all things pumpkin right at that time too. So I feel like because I had experienced with posting pumpkin things in the past, I knew that this timing would be helpful for the. Beth: Yeah, absolutely. And for those of you listening, I think the take home for you is to really know your market and your book idea, whatever that relates to, if there’s a time of year when people are really interested in that topic, try to time your launch right around then because that’s a really smart strategy and ultimately you’ll sell more books that way. And so Maggie, could you tell us, I guess a little bit about what you did before the launch to make that successful? Because I’ll give an example. Obviously I’m following you on social media and you did an amazing job of just talking about your book regularly and promoting it even before you went into the hard push in the couple of weeks before the book launch. So can you tell us a little bit about your strategy and what you did and how that worked for you? Maggie: Yeah! So I think the first big kind of announcement I did was maybe right at the end of spring or the beginning of summer and I think this was definitely with your guidance was to crowdsource what the cover would look like. And this really I think really helped to draw people in because I feel like everyone wants to vote for something, right? So I just like put them a bunch of options that I easily created and had people vote for what they liked the best as the cover. And so that kind of kick started things and then I kid you not, people would ask because they voted, they wanted to know more details as the weeks we’re going on. And even in the summer if I would show that I was cooking something behind the scenes in my kitchen for it, um, they would always, you know, ask. And it’s crazy because even when the book now that it’s out, I still have people seeing, I made it a story highlight about voting for the cover and people will still message me thinking that they can vote. Maggie: So it’s still kind of like a thing that is being looked at. Um, but yeah, I think the more I talked about being in the kitchen and making something or testing something or showing you part of a final recipe or just teasing something a little bit that I was working on for that day really drew people in and got them excited as navy. They started to think about in the summer to start to think about pumpkin things. And so I really saw a lot of great feedback from that and although sometimes I was like, okay, should I say this out there? I don’t know if this recipe is going to work and it’s going to end up being in there, but that was okay too. Like even the little trial and errors that I was experiencing with the recipes I think were really beneficial to share. Beth: Yes, and I hope that listeners, you take that to heart and that you understand that promoting your book early is number one smart because it gets people excited as you heard from Maggie and her audience, but also it doesn’t have to be super difficult. You can just show some shots behind the scenes and that gets people really excited and the more you’re working on it, the more you can just, you know, share once or twice a week even on Instagram Stories and it gets people really psyched for your books. So when it launches, they’re ready for it. They’ve been seeing you make it and they want their copy. Beth: So one reason why I really wanted to get you on the podcast…I had many reasons, but one of them is because I was so impressed by how you got brands to sponsor the cookbook and so you obviously worked with them and worked out an agreement so that they paid for inclusion of special sponsored recipes in the cookbook. So, could you talk to us about the process that you went through to get those sponsorships and sort of what that whole process look like? Maggie: Yeah, definitely. So this was, this was kind of a twofold idea for me going into this fall and thinking through how I wanted to extend my brand partnerships with some of the brands that I work with. I just saw I want it to be something more than just one Instagram post and for all the brands included in the book, they are really valued of mine and I really respect them and recommend our products. So I just thought, how else can I extend this to work a little bit more for both of us? And so then as I was thinking through the book, I thought, well it would be cool if I, as I was already creating my own recipes for this, if I could incorporate some of these products that I would naturally use in these recipes anyways, and then they can use this content this fall, it can extend it to next fall. Maggie: I mean some of these recipes, two are interchangeable where, yeah, you can use all year round in them, but if you want to swap out a different flavor here and there or, you know, make the rescue without the Pumpkin at a different time, you can do that too. So I really wanted to create this evergreen content for them as well. Um, and luckily that really worked out in their favorite and my favorite as well. So we were able to partner on a couple of different things for each of them and I think it really uniquely displayed their product in a fun, seasonal way too, if they, if they had a seasonal product, which most of these brands do. Beth: Yeah, absolutely. And so for food bloggers who are listening to this, who say, oh my goodness, I can get sponsors for my cookbook, this is a game changer. Can you give us a little bit of insight into what that process looked like for you? I guess first of all, did you already have a relationship with these brands or was it a new relationship? And then how did you go about actually pitching them on the sponsored content in the book? Maggie: So for some of these brands I did have a previous relationship with them and was thinking, okay, I know I want to do something with, in the fall too, but how can we make that extend more? So for them it was pretty easy once I like thought of how it was going to package things up to reach out and explain my vision for it. But basically what I did was I put together a pretty simple one pager and a second page of a mock up of what I thought the book cover might look like and what I thought I have a two page spread would look like. Maggie: And so then the package list kind of outlined exactly what the different packages were, how many recipes would be included, and then what else would be included in that. So with the recipe sponsorship, I also offered Instagram posts and for their sponsorship or visibility on my blog and through Pinterest and Facebook and my other channels and Instagram stories. And so I laid all of that out there within the packages on the one pager and then sent along the mock up of what I thought it would look like to. Maggie: And with that too, I tried to really convey my vision for what I thought I could do for them and what the, what the recipe would look like. So for example, I would also send over a couple of recipe ideas and maybe if there was a food holiday that I thought would really coincide with, okay, we’re going to do a Pumpkin cheesecake recipe and I think it’d be really cool to talk about it on National Pumpkin cheesecake day. I really laid that all out there in, in detail as best as I could to really get them as excited as I was about this idea. Beth: Yeah, absolutely. And it wound up being incredibly successful for you. You had, I think four or five sponsors, correct? Beth: And what I loved about how you did things too, is that particularly with your book, a lot of people I think naturally just assume pumpkin. Okay. We’re going to be talking about sweets, like Pumpkin bread and like you mentioned Pumpkin cheesecake, but you really made sure that if the brand was interested that they had both sweet and savory options, too few where their product would be featured. Maggie: Yeah. And I, I think that was too something that maybe set me apart too is because I was, for example, approaching Libby’s Pumpkin who I know has a lot of pumpkin recipes out there already. Maggie: So I was thinking well, how do I make myself stand out and what would be valuable to them if they are, you know, sponsoring this and, and I’m going in on it with me. So what other recipes would they be looking for? So I tried to really do a wide variety, not only because I want to show people the savory side of Pumpkin, but because I think, you know, maybe brands with seasonal products are pumpkin themes, maybe don’t have a lot of savory stuff too. So I liked that variety for sure in the book, and I think it was well received by the sponsors as well. Beth: Yeah, absolutely. And so I think, and correct me if I’m wrong, for any food bloggers who are listening to this interview, that if you are going to pitch to brands to ask them to help sponsor the cookbook or to include sponsored recipes in the cookbook to maybe think outside of the box or think about ways that that product could be used in a somewhat untraditional way so that they can get a wider breadth of exposure for their products and then you get also the experience of working with products in unique ways and they’re honestly helps you build a better relationship with the brand too. Right? Maggie: For sure. That’s 100 percent correct. And one thing I’ll just add on there too is like for one of the brands that I worked with, their Pumpkin is just a seasonal flavor so it will go away after the season, but the recipe is evergreen in the sense that you can swap out any of their other flavors into it. And that was part of the selling point was yeah, I want to highlight the pumpkin or pumpkin spice flavor of this now. But I can continue on talking about this recipe all year in multiple different ways because there’s other flavors as yours that we can just put in. Beth: So I want to take a big picture, look at the process of creating your book and to help prospective authors get a better idea of what it’s like. So could you first and foremost tell us about what you found to be surprisingly hard about writing the book and putting it together? Maggie: Yeah. So one of the things, and maybe you noticed, but um, I think I had, I was really into doing all the kitchen parts, so I will every day I would test and retest and tweak and take photos, but actually sitting down to write down the recipe or just transfer it from like my scratch piece of paper to the computer and then write about. It was just a little more time consuming. But it was just harder for me to like get to sit down and to do that part of it. Maggie: So it was just keeping up and making sure I had everything organized and tracked in my spreadsheets and making sure that everything matched up I think was, um, a little bit harder than I thought. I think I had a lot of fun in the kitchen with everything and taking the picture. So that’s kind of sitting down to do some of the admin work. I was like, okay, this is probably going to take me longer than I budgeted for it today, but good for people to know just so that they can know if they’re working on their own book to a budget that time. Beth: And then I always like to end on a positive note. So what did you find surprisingly easy about the process? Maggie: I will say working with you made it so easy. Not only did I love talking to you through the entire process, but um, I think as you sort of guided me through those questions and little quirks that I had questions on, um, I think that helps me to really get into my groove when I did have to sit down and do all of those things. I think it was really easy to, to think about the different categories that I wanted to have in there when I was showing pumpkin stuff and maybe that’s different for a cookbook that’s showing multiple categories or multiple cuisine types per se, but I think I knew that I wanted certain category for cookies or breakfast foods or savory items and so that was, that was fun and easy to put together and once I had laid that framework, it was easy to pop in where I thought the recipes would go. Beth: Yeah, absolutely. And now I have all of the feels. I promise that was unprompted. Thank you. So Maggie, what advice do you have for other food bloggers who want to write a cookbook or even bloggers who are just bloggers in general of any genre who are thinking about writing a book? Maggie: Yeah, well I think too on the note with a brands, if that is something that they’re thinking of, if you’re thinking of going out to maybe brands that you’ve worked with before and seeing if they’re interested in this. I say go, go all out and go in and do that because I think it can be really successful for you and for that brand. I definitely think working with you, Beth is, a great route to go, not only for you so knowledgeable in everything that I had no idea about and stuff like that, but really made the process so much smoother than it would have been if I went into this, um, myself completely and not, not knowing how to really approach all of the, the little steps that go into it. Maggie: So I think to budgeting time, and laying out a really good timeline ahead of time. Is it something that’d be important. And there’s of course always going to be things that pop up unexpectedly. And maybe that’s like the beautiful thing of the most beautiful thing that comes out of your book though. So embrace that. Something may happen midway that you’re like, “Oh, I don’t know, is this going to be a fork in the road or is this book going to be, you know, all that I want it to be. ?” I think it will end up being all that you wanted to be and more. Beth: Absolutely. And there are ways to hustle around it and make it work. I know that there were some things that came up, unexpected opportunities, but it wound up being actually really good. Maggie: Yeah. And too, it’s like crazy how when this book becomes your baby kind of, you’re like, okay, I want to make time, I’m going to make the time to get this the way that I’m want it to be. And I think allowing yourself to kind of test out how you’re going to manage your time and stuff like that is okay. And then once you get in the groove I think um, it’ll end up turning out really nice. Beth: Absolutely. And sort of a side question, what was it like for you when you first got your first printed copy of the book and held that actually in your hands and saw, this is my book, I did this. Like what was that feeling like for you? Maggie: It was pretty crazy. I, I mean I guess I didn’t realize that it was going to be that, like have the. I knew it was going to have the shiny copper and stuff like that, but definitely seeing that for the first time and opening the Amazon box was like, oh my gosh, like this is all my hard work for the past, like couple months, like all coming together. And so it was really crazy and it was, it was super cool. And then, you know, now as I see people getting their books and posting pictures of it, that’s like the biggest. It just like makes my day, it makes me so happy every single day that I’m like, oh my gosh, this person’s excited about it. I’m excited about it too. And so yeah, having the hard copy just sitting around the house, it was like, Whoa, what, how did that get here? Beth: I’m so happy that you got to have that experience. And for those of you who listening, it’s an amazing feeling and it’s one that I really do think you remember your entire life. Maggie: For sure. Definitely. And I think, I think it’s something that will extend for, for years. I mean, not only all of the year, but I know once every fall comes again. I think I’ll feel that renewed feeling of like giddy excitement towards it again. Beth: Absolutely. Absolutely. No, this is a personal side note, but I published my first book around this time and so then you know, you’ve got like the Time Hop type of things where social media reminds you that, oh hey, so-and- so many years ago, you got your book for the first time and it just, you get to relive the moment. So it’s, it’s something that’s really special and I’m excited for you to get to experience that next year. Beth: Of course. So Maggie, for people who are interested in following you and getting some great pumpkin recipes and just staying in touch, where could they find you and where can they get a copy of the book Once upon a Pumpkin? Maggie: Yeah. So, uh, you can find me @onceuponapumpkin on Instagram, and at onceuponapumpkinrd.com. You can get in touch with me that way. You can just put “once upon a pumpkin” into your search bar on Amazon and the book will pop up, so that is how you can get yourself a copy. Beth: Absolutely! Go definitely grab your copy, especially if you’re listening to this when it comes out. It’s the perfect time for pumpkin, so make sure you go grab your book, makes some great recipes. And, especially for those of you who are thinking about doing sponsored posts are doing sponsored recipes in your cookbook, grab a copy of Maggie’s book as a way to see how she did it and I think that she did a really great job of featuring those, so use it as an example as well. Maggie: Well, I couldn’t have done it without your help. Beth: I’m happy, happy, happy to help. Maggie, thank you so much for taking the time to be on the podcast and to share your insight into the process. I really appreciate it. Maggie: Thank you so much that I can’t think you enough honestly, because you brought my pumpkin world to life this fall. Um, and really I couldn’t have done it without you, so thank you so much. Beth: Oh, you’re very welcome. It was really sincerely my pleasure. YES, GIVE ME MY FREE GUIDE!